You know that popping a vitamin E might ward off the cold that’s going around. But what about smoothing it on your skin? Spoiler alert: This versatile antioxidant is also your daily dose of glow. A vitamin that dissolves in fat, vitamin E is in almost everything you eat – cereal, meat, poultry, vegetables, fruits, you name it. Chock full of health benefits, this do-it-all nutrient is good for your heart, eyes, immune system and even physical endurance. But what we’re really loving about it? Read on. WHAT ARE THE VITAMIN E BENEFITS FOR SKIN? 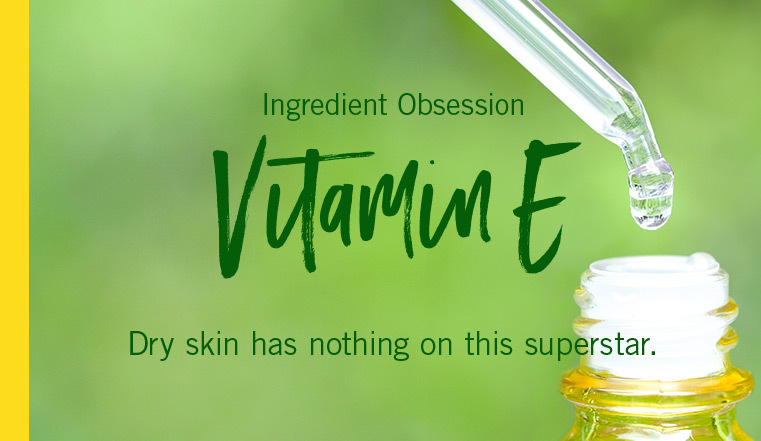 Vitamin E isn’t one of those buzzworthy, tough-to-pronounce ingredients that just burst on the beauty scene. It’s been around forever, so it’s easy to forget just how amazing it is for your skin. We’re big fans of vitamin E in our body lotions and hand soaps. It’s what dry skin craves. A natural moisturizer, it’s a go-to for people with itchy, rough skin. Don’t go into winter hibernation without it. It’s a handy hydrator. Your hands go through a lot – typing, texting, cooking, driving, etc. Give them some love with vitamin E, known for its skin-hydrating and nourishing power. It softens and smooths. All those antioxidants help keep skin silky soft and protect it from the elements. It can block out the sun. It won’t replace your daily SPF, but vitamin E cream can help amp up your skin’s defenses against free radicals and harmful UV rays. It may zap stretch marks and scars. No guarantees, but some swear by vitamin E’s ability to reduce the appearance of scars and stretch marks.